Line bottom and sides of 11x7-inch glass baking dish or pan with foil, leaving 1 inch foil overhanging on 2 opposite sides of pan; grease foil with butter. In 3-quart heavy saucepan, melt butter over medium heat. Stir in brown sugar, 1/2 teaspoon salt, the corn syrup and milk. Cook over medium heat, stirring constantly, until mixture begins to boil. Reduce heat to medium-low. Cook 40 to 50 minutes or until 248°F on candy thermometer (firm ball stage). Remove from heat; stir in vanilla. Pour into pan. Refrigerate about 1 hour or until completely cooled. In small microwavable bowl, microwave chocolate chips and oil on High 30 to 40 seconds, stirring every 10 seconds, until chocolate is melted. Using spatula, spread chocolate evenly over caramel layer. Sprinkle with 1 teaspoon salt. Refrigerate about 30 minutes or until chocolate is set. Remove caramels from baking dish to cutting surface, using foil to lift; peel back foil. Cut into 8 rows by 6 rows. Store at room temperature. If you don’t have coarse sea salt, any coarse salt will do. 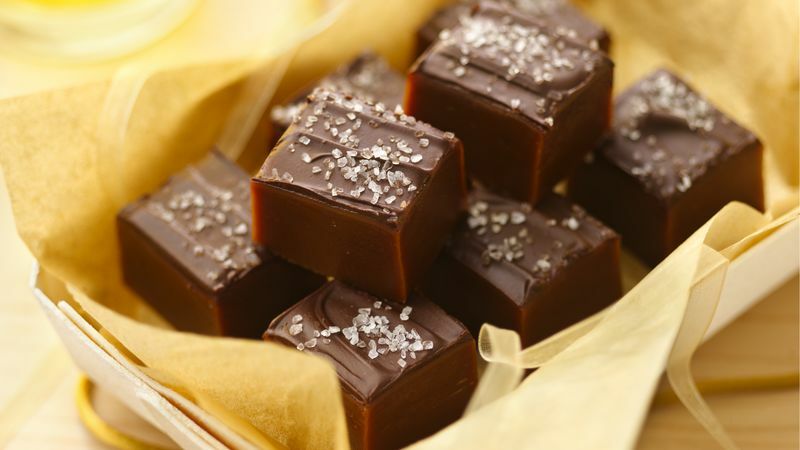 To serve, place caramels in mini decorative paper baking cups if desired.